DIY is on the rise, and Halloween is the perfect opportunity to get your creative juices flowing. While ready-made costumes are an easy fix, they can cost a pretty penny and you can easily run into a doppelganger (or two, or three) at your holiday bash. Craft yourself a unique costume this year, and stand out from the conventional. Here are 10 examples of Halloween DIY Costumes that you can make with a minimal budget, with maximum effects. Iconic, empowering, and easy as can be. 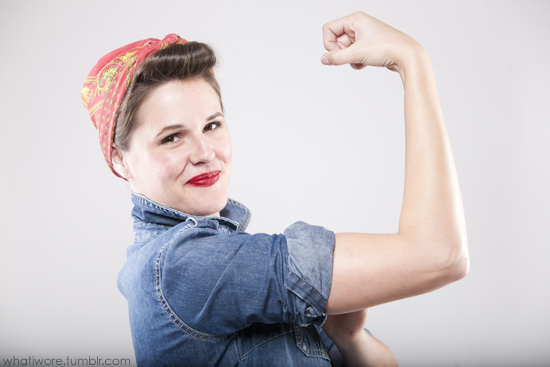 Become a walking symbol of female strength from WWII with just three simple steps. If you don’t have one already, chambray shirts are in season and easy to find at most department stores, which you can then pair with your favorite jeans. Any red bandana would do, but if you want to stay loyal to the original look, you can find red polka dot cloth at a local fabric shop. The third and honestly most fun step is the styling. Curl your bangs into a retro pomp and put on your best pin up makeup. Practice your flexing, and remember...you can do it! Tetris: a game that is wonderfully simple, yet incredibly addicting. For all you gamers out there, this old school costume is sure to turn heads, and is the perfect opportunity for a gaming couple. The best part? It’s extremely easy to make. Stock up on cardboard boxes, and create your colored tiles by using construction paper or paint. Line the edges with duct tape or black electrical tape, and cut out the appropriate openings for your body to squeeze in. BONUS: Go as a group of tiles and bring the entertaining puzzle to life. By rearranging yourselves into endless combinations, you’ve become the ultimate party game. Embody the most elusive backpacker of the 90’s and get lost in the crowd. Keep your friends guessing as you pop in and out of the party. The iconic red and white combo is easy to find or make: Purchase a red and white striped shirt and beanie from a department store, online, or make one yourself by painting a white shirt and hat. Most costume shops will have round frames for purchase on the cheap. 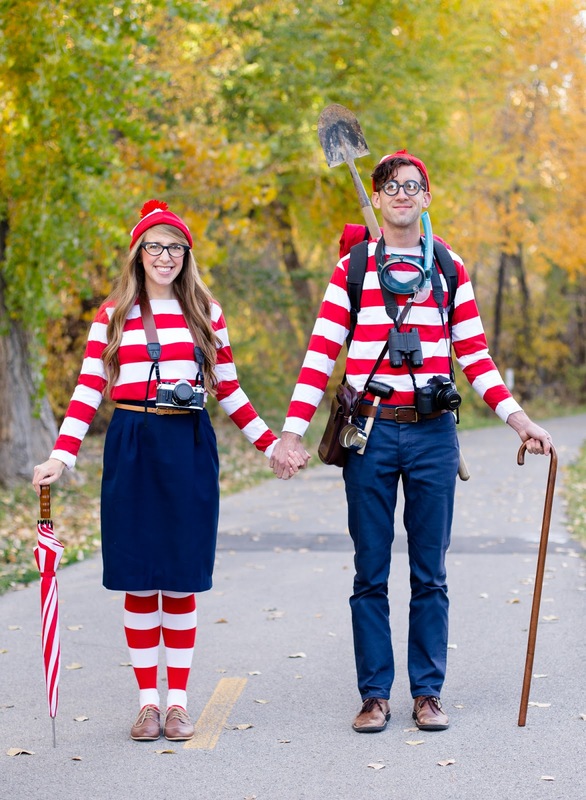 BONUS: bring some Waldo accessories: binoculars, walking stick, snorkel, shovel, camera, and more. Leave them on the scene as clues to where you are, and see how long it takes for people to find you. Either way, your fellow party guests will be shouting "THERE’S WALDO!" all night long. The thrift is strong with this one. 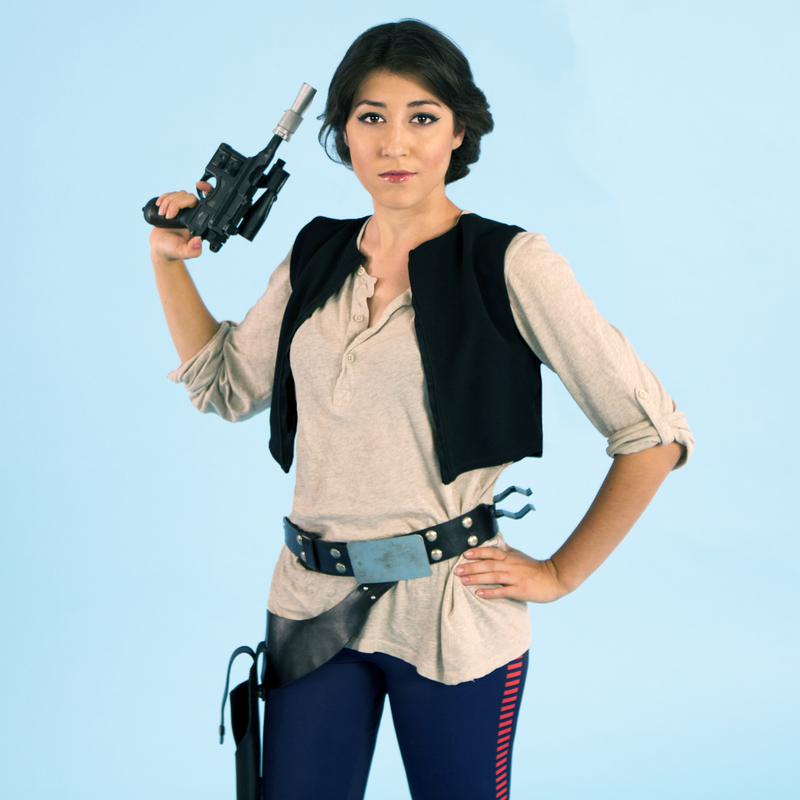 You can find most of your items at a second-hand store to make a basic Han Solo costume from A New Hope. Grab a cream long sleeve with buttons on the front, or cut a slit yourself. Either pick up an old utility jacket and cut off the sleeves, or opt for a simple black vest. Any navy blue pants would do, as they’ll be tucked into black boots and adorned by a studded belt. If you want to hit the smaller details, there are many tutorials on how to make this holster and belt from found materials, such as an old purse. For the gun, you can pick up a water pistol from any dollar store, and either paint it black or leave it as it is for kitsch factor. BONUS: Bring your fido or a particularly bearded friend as your Chewbacca, or a sweetheart as your Leia. Get ready for no-shave November while sporting this rugged yet effortless costume. Grab a red plaid shirt from a local thrift store, pair with your favorite jeans, and snag a roll of Brawny paper towels. BONUS: Have a friend or a date join in. All they have to do is wear a white outfit, either print out or simply cut the logo off of a Brawny roll, and stick it on. Estimated price: 5 bucks or less. Any art buff would recognize the work of surrealist Magritte and his common apple motif. With a second-hand suit or blazer, red tie, white shirt, and bowler hat, you’re mostly done. Print out the apple from a photo of his painting, and attach it to the front of your hat. BONUS: If your brim game is strong, opt for an actual apple and hope that your party guests didn’t come hungry. Become a walking, talking, wasabi hocking piece of sushi. For your rice, all you need are a white pair of pants and shirt. Your nori can either be a belt made from black fabric, or even snip a strip off of an old black t-shirt. The most complicated and most delicious part of your sushi is the fish: either find and purchase an orange (salmon), red (tuna), or pink (shrimp) pillow or sew one yourself from a t-shirt, and either paint or sew on white stripes. For your wasabi, you can sew a dollop yourself (tutorial found here), or purchase a dollar loofah in green, and pink if you want ginger as well. Put your hair up in a bun if it’s long enough, and stick a couple chopsticks through your bun. BONUS: If you’re planning on having a boozy Halloween this year (considering that it’s on a Saturday), your fishy pillow will cushion the sloppiest of falls. When life gives you lemons, make a costume and pay it forward. Work with what you got, and teach others to do the same with this brilliant (and lazy) costume. All you need is a cheap white t-shirt, a marker, and a handful of lemons. Write “Life” on your shirt, and become a walking proverb of positivity. BONUS: If you bring a steady supply of lemons and you’re at a house party, people can actually make lemonade with what you give them (or at least a lemony cocktail). Guaranteed to give a good laugh to all who know this afro-wielding artist, Bob Ross is a shockingly easy costume to craft yourself. Skip the perm and buy a brown wig, grab a button down from your closet, and either purchase or make yourself a cardboard palette. BONUS: A Bob Ross painting wouldn’t be complete without a happy tree, which makes the perfect opportunity for a couples costume. Whether you truly didn’t have the time to pull together a costume or have that one friend who hates dressing up for Halloween, you can still rock this simple and delightfully lazy costume. Anyone who has been redirected to a dead web page will have a good laugh over this tongue-in-cheek status code. All you need is a marker and t-shirt to achieve maximum Halloween trolldom. BONUS: Find fellow anti-costumers out there, such as Nudists on Strike or Muggles. Rush49 Blog © 2019 .